We are a Taekwondo based martial art. Taekwondo is one of the best stand up striking, punching and kicking arts which is suited for self defence in today’s modern world. At Essex Martial Arts not only will you learn martial art skills that will build your confidence, fitness and stamina. We will also develop your positive mental attitude. This is accomplished by the grading system for rank promotion and the tuition not only from Master Slater but other black belts and your fellow students. Essex Martial Arts has something to offer every one, irrespective of their current level of ability and fitness. 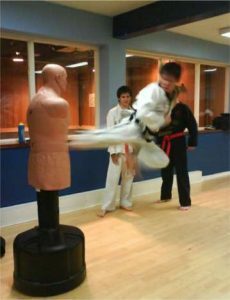 Taekwondo is famous for it kicks. Out of all the Martial Arts, it probably has the most variety of kicks and is responsible for the advancement of many kicks in other styles, Bruce Lee himself took up Taekwondo for it’s kicking ability.